That's how I'm feeling today. Actually, I'm not sure exactly how to feel. I'm a little of everything-- tired, worried, happy, sad. 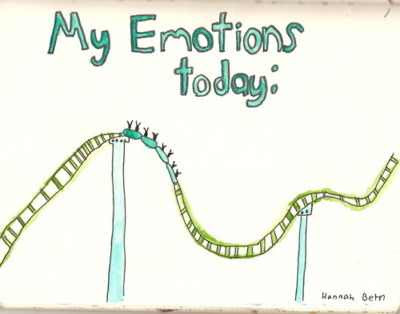 A whirlwind of emotions, aka emo. Hang on tight as this post is going to take you on an emotional roller coaster . First we'll start with a recap of our uber busy, but fun, weekend. After quite a few hours at the park and some lunch, we were homeward bound for a nap. Well, for the boys at least. Rich and I watched "Ted" and I must say that I'm not sure what all the hype was about... besides Marky Mark and Mila Kunis, anyway. Those two together are some kind of HOT, but the movie was pretty bad. We maybe laughed a few times. Maybe it's just us? Sunday morning, we had another play date scheduled with Spencer's other girlfriend, Ellie. Yes, he has a couple in rotation. I'm telling you, this kid has a busier social life than Rich and I put together. We all met at Monkey Joe's which was our first visit there. For those not familiar, it is an indoor play place for kids which includes quite the selection of bounce houses and video games. Luckily, they have an "age three and under" area which is where we spent most of our time. The kids had three bounce houses to choose from where the bigger kids weren't allowed, and that of course, put us all at ease to know they weren't going to get trampled by a ten year old. Spencer and Ellie literally bounced around for hours. They had so much fun together and you can imagine the amount of pictures and video we captured, but I'll only spare you a few. Needless to say, we had one busy weekend. We are so happy to have great friends not only for our boys, but for us too. We enjoy those times we get to spend with each of them. Since Cam was born, he would not sleep any longer than two hours on his back. After about two months of this constant waking in the middle of the night, we caved and allowed him to sleep on his belly. I say "caved" because children are not supposed to belly sleep. According to research, this is/was one of the main causes of SIDS in the eighties. Since they started promoting back sleeping, SIDS has decreased by 50%. I know that some of you allowed your children to sleep on their bellies or that you, yourself, slept on your belly and we're all here, and well, today. Unfortunately, a lot of other parents weren't so lucky. Because of this story and the awareness it has brought, I am now scared shitless to allow Cameron to continue his belly sleeping. I've been questioning my rationale these past couple of days. Maybe it was me being a little selfish all to get a good 8-10 hours of sleep each night, but I've come to the realization that it's not worth it to me. If anything were to ever happen to either of my boys, I wouldn't be able to, and couldn't, live with myself... with ourselves. The thought makes me so sick to my stomach. I am sick for that family. So last night was "Operation Back to Sleep" for Cameron, which was a big fail. We went from his regulated schedule of sleeping 8+ hours per night, to waking every two hours or less. Rich and I are exhausted! As soon as we lay him down, he flings his arms like he's falling, which in turn wakes him up. This cycle lasted alllll night. Our nanny is aware of this new sleeping arrangement and has been trying to lay him down all day. With him not sleeping well last night, then not napping today because he's refusing his back, the poor boy is exhausted. I feel so sorry for him, but little does he know this is the best for him. I feel like we're sleep training all over again, which we really never had to do in the first place because he was so comfy on his belly. He would go down for us with no problems. Any, and all, tips or tricks are welcome. One last pic and I'm out. Spencer and his Speech Therapist made me an early Valentine's Day present and on my desk it will stay. I have enjoyed looking at it all day long. Speaking of Valentine's Day, I hope it's a special day for most of you. Pre-kids we would celebrate, but things have changed a bit around here. My boys are my gift... all day, every day. We struggled with Harlyn and her sleep. She was not a back sleeper at all, and would only sleep on her stomach. I felt more comfortable with her on her stomach, as I worried she may vomit on her back, and not be able to clear her airway resulting in her choking. Our pediatrician said that, "They still do not know what causes SIDS, but there has been a decrease in SIDS deaths since they advocated them sleeping on their backs, but there has also been all kinds of changes in the materials used in the mattresses and so on, and that basically since they don't know what causes SIDS, they also don't know what has caused a decrease in SIDS, it very well could be do to the changes in the bedding material, and not the back sleeping" He also went on to say that if Harlyn sleeps fine on her stomach, let her sleep on her stomach. Which was reassuring to me, because I felt safer with her sleeping on her stomach due to the risk of her ineffectively clearing her airway after spitting up. Thank you for the response, Mel. It's amazing how not all Dr.'s are on the same page. Mine is strongly against it. We're trying to work on the back sleeping, but it hasn't been much success. I totally agree with Anonymous. Horrible tragedies occur around the world daily but, in my humble opinion, we can't live our lives in fear of it. There are always knee jerk reactions to things, thus they came up with the back sleeping business. I know I would be miserable sleeping on my back. How about you? The ideal arrangement is side sleeping, but at his age, that's not possible--go with his tummy and get some sleep! We don't have a back sleeper but I have always found that both of my kids sleep the best in the Fisher Price Rock and Play sleeper. I always feel like they are "safe" there so I worry a LITTLE less. A mother's job of worrying never ends! It's so hard - SO hard - not to let in the fear of losing yours when you hear about someone else's loss. A local kid was recently killed in a car accident and it brought on a huge wave of fear for me since Hannah now has friends who drive. And fear clouds our thinking and makes it hard to think rationally. Swaddling worked for us and I hope something like that can work for you, too. Here's a totally non-comforting thought: once you stop worrying about SIDS, there will be something new to worry about! All part of the fun! So glad you're keeping up this blog. I'm sure it's not easy but I love being able to see the boys!